I want to be clear: as a nutrition professional, I do not focus on weight loss. I don't focus on weight loss because it's just not all that interesting to me. What's interesting to me is the optimal functioning of my clients' bodies and minds, which often does impact weight. 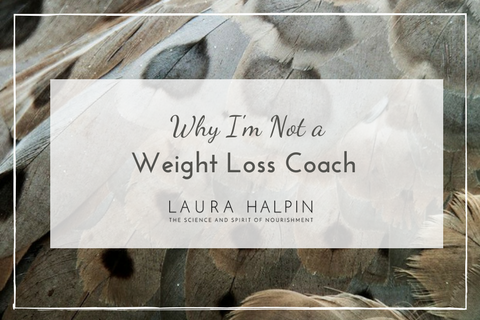 Even so, although weight can be a significant source of suffering for my clients, the weight isn't necessarily the root of suffering, as much as beliefs about weight. As a culture, we are starting to get the memo that diets fail, yet the disordered thinking around body size persist and continue to cause radical harm. The pervasive emphasis on thin as ideal threatens the most important relationship each of us have: the relationship with ourselves. The cultural "norm" sets us up for a dangerous caveat to self-acceptance: unless our bodies are thin, we can't love ourselves. I still don't understand how beautiful Oprah decided to become Weight Watchers' spokesperson, knowing the power of her own influence on women and girls on the planet. I find her decision indicative of her own body image wounding. Last month, Weight Watchers launched a new free teen program offered with parental consent through the age of 17. No matter its emphasis on health, our children do NOT belong in an organization called "Weight Watchers." Please. Our teens have so many other worthwhile things to do with their time than watch their bodies grow or shrink (case in point: the teens who'vve organized marches across the country to protect their lives from gun violence). Food should be a source nourishment, pleasure, and provide connection to the earth, to others and to our bodies. Instead, thanks to media's glorification of skinny (emaciated and unhealthy) models and actors, we grow up with the idea, no matter our heritage or body type, our bodies are beautiful only if they look a certain way. And thanks to a medical establishment and a diet industry that focus on nutritionism over nourishment, we've learned to interact with food in a way that is medicalized and quantitative: portion sizes, points, calories and deprivation (no salt, no fat, no red meat, no sugar, no...). An estimated 8 million Americans have an eating disorder. "Eating disorders have the highest mortality rates of any mental illness." Please read that again. 95% of those who have eating disorders are between the ages of 12 and 25. 80% of 13-year-olds have tried to lose weight. According to the SCMDH eating disorder statistics, a slim percentage of those suffering from eating disorders get treatment, and when they do, generally treatment is not intense or long enough to ensure long-term recovery. Eating disorders are not exclusive to women and men of any particular ethnicity, nor do disordered eating or body image issues disappear after adults mature. According to the review article, "Body Image in Adult Women: Moving Beyond the Younger Years," published in the journal Advances in Eating Disorders, women's body issues don't necessary go away, but become more complex, due to societal glorification of not only thinness, but youth. The article reported that nearly 64% of over 1,800 women ages 50 years and older reported experiencing thoughts about their weight on a daily basis. Nearly 84% of these women reported dissatisfaction with their stomach. These stats make me both sad and angry. According to Jessica Drummond, founder of The Integrative Women's Health Institute, those of us in the health field have to work at the cultural level to bring about change. It is my belief that we ALL have to. Educating myself and my clients about ways to promote body acceptance for ourselves and for others around us. Promoting the work of culture changers who promote body love and weight-neutral messages. Recently, I was in conversation with a young woman in her early 20s who is struggling with a distorted body image. She is doing her best to focus on her health, not on her size. No matter her best efforts to refrain from body criticism, when she is with other female friends who are lamenting the size of their own thighs (which are smaller than hers), it becomes very difficult to stay in a place of acceptance and self-love. My point in sharing this is to emphasize that it's far too difficult to heal individually while steeped in social and family relationships where disordered thinking is unchecked. In fact, each of us must realize that healing our own body image issues is work we must do for each other. For older women, it is important to do our own work toward self-love and body appreciation in order to model healthy attitudes toward weight and size for own own children. Men, of course, have a role to play in dismantling societal worship of thin. There are a number of organizations that are working to turn the tide in our thin worshiping culture. Please check these out. Immersing ourselves in some education will help us break out of this oppressive and dangerous paradigm. I have found the messages to be empowering and healing. Health at Every Size - this is a great place to start. Circles of Change - "A Movement to Change the Culture and Conversation around Health, Beauty and Body Image." Be Nourished - Check out their Body Trust and Be Nourished E-courses. MEDA (Multi-Service Eating Disorders Association) - Their mission: To heal, educate and empower our community to support the people, families and other community members impacted by eating disorders, to stop the spread of eating disorders through educational awareness and early detection, and to promote greater acceptance of all body types. Stop talking about your body or anyone else's body. Deliberately expand your definition of beauty to include character, confidence, love and generosity. Accept compliments by saying "thank you." Be gentle with yourself. Understand that if you feel stuck in the hell of "I can't love myself until I'm thin (or _____ or _____)," this mindset isn't a sign of weakness nor is it your fault. We've been immersed in the glorification of thin/perfect for our entire lives. Spend time every day replacing your criticism with gratitude for the ways your body supports you. Thinking about the fat on your back? Then quickly move your thoughts to gratitude: you have a strong spine that allows you to walk, move, etc. Angry at your thighs for not being thinner? Spend a moment appreciating how much your life would change without your legs. Our imperfect bodies are miraculous. Become aware of health professionals who veil diets in the form of cleanses. There is nothing wrong with a cleanse, but do watch the language around the programming. Refrain from participating in body-critical conversations with your children. Never again. If you can't help yourself, then please get help. If you choose to work with me and you're unsatisfied with your weight, please know that our work together will involve focusing on the imbalances in your body. We will work on shifting your mindset from a place of body-image-obsession to body trust and appreciation, regardless of your weight. We will look at thyroid and adrenal health, blood sugar imbalances, stress, inflammation, gut health, toxic exposures and food sensitivities.You will find that your body makes sense. It's fascinating and loving work to tune into your body rather than trying to override its messages. I am considering offering a series for high school and college age girls to educate about nourishment, body trust, and becoming part of a cultural shift in body-image awareness. It would be especially powerful if young women registered with their friends as a way to support each other, not only themselves. Thinking about summertime and especially want to reach young women who are ready to head off for college. I'd love to hear from you if this type of offering would be interesting to your daughter. Please email me at laura@laurahalpin.com so I know to move forward. Please be careful of any hint of perfectionism when it comes to food. You might have heard of an eating disorder called orthorexia which involves an obsession with eating healthy foods. This condition often begins with the elimination of foods that a person considers unhealthy. Please watch for this in yourself as well as in your kids. In times of stress, you might observe your child's healthy interest veers into a place of unhealthy control. Pay attention. In general, I've spent my life in a thin body, and perhaps this makes me a less than credible resource when it comes to a conversation about body image. I get that. Despite my body frame, I am no stranger to other versions of body image issues, self-criticism and food obsessions. I am on my own journey to fully embrace and celebrate my own body with its gifts, quirks and limitations, especially as my hormones shift. Regardless, as a nutrition consultant and health coach, I feel it is pressing to take a stance and state clearly that I will not willingly exacerbate dis-ease in the world by promoting any form of dieting or body shaming. I believe we all have important work to do in this world. We don't have the time to punish our bodies when they are serving us in miraculous ways every single day. I look forward to hearing your thoughts. Feel free to share resources you have found valuable. I welcome learning from you.